Our vendor bundle is coming in at 752kB! First things first we need to find out why our vendor bundle is so big in the first place. Luckily Nuxt uses webpack-bundle-analyzer so we can simply add the following to our nuxt.config.js under the build property. Then when you run npm run generate it will open up the build analyser at http://127.0.0.1:8888. 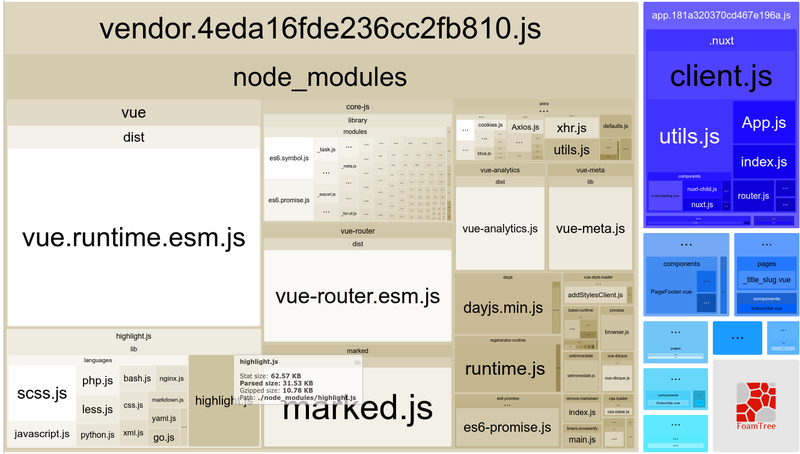 Looking at this we can see the highlight.js package is very big with a parsed size of 540kB! If we inspect this further we can see this is mainly due to a few languages included with it like mathematica.js or sqf.js. Now in my case I only use a handful of common languages so I don't need any of the other included ones. After a little bit of searching I came across this comment on GitHub on how to acheive this. So let's give it a try and update our Nuxt site. I have a filters.js in the plugins directory where I was importing highlight.js. Make sure to only add the languages that you intend to use. 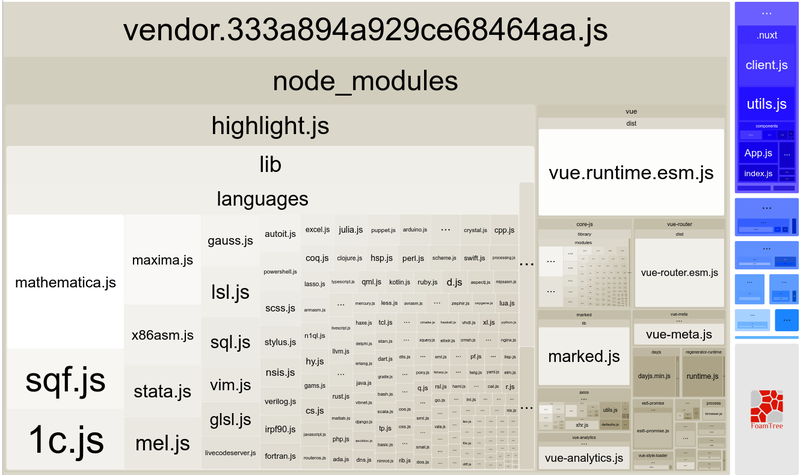 Then ran npm run generate again and had a look at the build analyser. This time the vendor bundle was only 226kB in parsed size, down from 752kB! That's a 70% decrease just from removing uneeded languages. As you can see we reduced the Highlight.js package down to 31.53kB from 540kB. And since our vendor bundle is now less than 300kB we no longer get the annoying warning in our terminal. Success! Another example we can use is with moment.js, which is usually overkill if you are only doing some basic date formatting. Another library that is much more lightweight and has a similar API is day.js. The reason we needed to import the advancedFormat plugin for day.js is simply because 'Do' is not included in the default day.js installation. We can now format dates in the same way as with moment but using a much smaller library. I'll try to add more examples here in the future. Fire over your email and I'll keep you updated once a month about any new posts. No Spam.